Himachal Pradesh Staff Selection Commission HPSSSB Recruitment 2017 latest job alert for all fresher and experienced candidates. Total number of posts are 2965. Candidates need to apply before 15th October 2017. Himstates will also provide Previous year question papers, notification, cut-off results and GK questions for HPSSSB exam 2017-18. The commission has been established with the purpose of recruiting capable competent, highly skilled individuals by conducting written tests, professional tests (Typing, Programming, Short Hand, Data Entry etc.) and personal interviews as per the requirement and suitability. Interested candidates need to have matriculation, secondary, Graduation and Post Graduation from any registered or recognized board and university. Those candidates who fulfil these qualifications may apply online for HP Subordinate service selection board recruitment. Age of eligible candidates must be between 18 Years to 45 years. Note : For Sub-Inspector of Police, 21 Years to 26 years. Relaxation :The Maximum age limit is relaxable by 5 years for aspirants belonging to SC, ST and Other Backward Classes, Grand Children of Freedom Fighters of Himachal Pradesh/ Persons with disabilities & Children. Note : Relaxation not applicable for Sub-Inspector of Police. 1. Visit to offcial website hpsssb.hp.gov.in. 2. Check official notification of HPSSSB Recruitment 2017. 3. Click on vaccancy for which you want to apply. 4. Fill online Himachal Pradesh SSSB Vacancy Application form. 5. Cross-check all the filled information. 6. After all correct information click submit button. 7. Don't forget to take final filled form copy. Himachal pradesh Police is doing Bharti(recruitment) of Male and Female candidates for the post of constables.July 21 is last date to apply for the posts of constables. Here syllabus, Last year question papers are also available. Pay Scales of Rs 5910-20200 plus Grade Pay Rs. 1900/- (Initial Start of Rs 7800) & after 8 years of regular service Pay Band will be Rs 10300-34800 plus Rupees 3200 GP. Note : Candidates must have valid registration of the Employment Exchange of HP on the date of submission of Application Form and He/She must be Bonafied Himachali. Candidates those who want to apply for the post should have passed in minimum 12th higher secondary class from any recognized board or any equivalent qualification. Age of candidates appearing for exam must be between 18 years to 23 yrs. Relaxation : Age relaxation will be as per the government rules and regulation. How to apply for HP constable post 2017 ? Candidates have to apply online through official website of himachal police mentioned below. 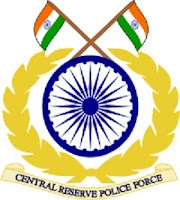 Himachal Pradesh Police official website - www.hppolice.nic.in. click on the 'submit' button and take a print out of filled application form for future use. The applications on the prescribed format will be submitted by the candidates on or before 21st July,2017 up to 5 PM by any Mode including by Post in the office of the district Superintendent of Police concerned with HP. Applicants will be selected on the basis of two process. Application form fee is according to categories mentioned below. Bank draft or IPO to be drawn in favor of the district Superintendent of Police concerned. For more details check official websites where you will get all information regarding age limit, height etc. State Bank of India is hiring for various positions and they have released official notification of recruitment of 255 officers in various specialised positions for Wealth Management. This hiring will be on contract basis. Last date to apply for the post is 10-04-2017. Detail about various positions, fee, Qualification ,selection Process and how to apply etc is given below. State Bank of India is largest bank of India owned by Government. SBI has been ranked 232 biggest corporation of 2016 by forbes global 500. State Bank of India has its headquarter located in Mumbai Maharashtra. 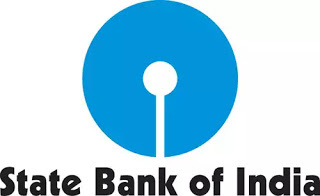 SBI bank was founded in year 1 July 1955, and got status of national Bank in year 1956. Candidates those who want to apply for various officers posts given above I'm State bank of India should have age according to posts given below. Age relaxation according to different categories is given in official notification below. Candidates must possess different Education Qualifications according to different posts given in detail below. Candidates should possess MBA/ PGDM from reputed Colleges. 4. For post of Investment Counsellor Candidates must be with CFP/ CFA/ SEBI IA Certifications. Candidates will be selected on basis of personal interview for officers posts. Candidates has to pay fee according to different categories given below. Payment mode - through online payment. Eligible candidates has to fill online application form and after payment hard copy of following given documents ( photocopies of ID Proof, date of birth certificate, educational qualification certificates, mark sheet/ degree certificate, experience certificate, brief resume, e receipt of fee payment, SC/ ST certificate, OBC certificate, PWD certificate) and form will have to send on given address below . Last date - 13 -04 - 2017. - Read official notification before apply for the posts. - Candidates must have valid email id and phone number. - Upload recent photograph and signature photo. - Don't forget to take printout of application form. Himachal Pradesh public service commission, Shimla has invited application for the post of forest Range officer 2017(Class - II) on contract basis. Number of posts are 50 and the Last date to submit application for the post of Himachal Forest Range officer is 11th April 2017. 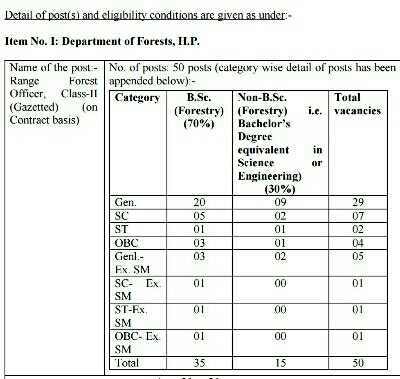 Candidates who want to apply for the post of Forest Range officer should have given age , education qualification, and other eligibility criteria given below. Don't forget to read syllabus and previous year question papers of HP forest Range officer given below. Candidates those who are interested to apply for the post of Forest Range officer , there age should be between 21 to 31 years. adhoc or on contract basis. Candidates must be graduate in science of engineering from a recognized institution or University. Candidates should be graduate in one of these given subjects. Total number of post for which HPPSC is hiring are 50. Out of which some are reserved for science graduates and some for non graduates given in detail below. Rs. 10300 – 34500/- Grade pay. 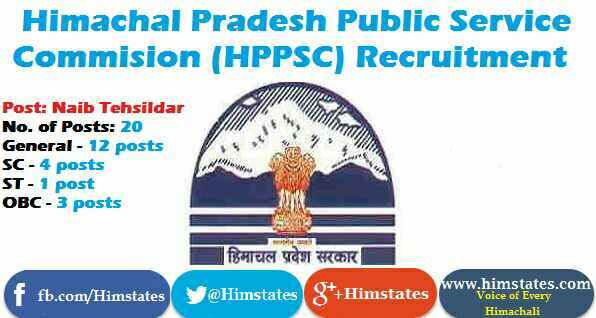 HPPSC will recruit for the post of Forest Range officer in following process. Interested candidates have to pay fee according to Categories given below. Payment will be received by HPPSC through e-Challan. - Candidates needs to go on to official website of HPPSC. - Select required post and fill needed details. - Read instructions carefully and don't forget to have working email id and phone number which is needed for future . - After filling all details click on apply button. - Pay fee through online mode . - Don't forget to printout filled form. Details about exam pattern, marks of each exam and other details given below. There will be three papers ,two are compulsory and one is optional. - Passages for summary or precis. - Essay on current topics on State, National, International events. Summary on precis 20 marks. Mathematics, Physics, Statistics, Veterinary Science & Zoology. Candidates are required to offer two of the above subjects. For syllabus & Previous year questions paper go below on this page. Himachal Pradesh police is recruiting for the post of constable and have invited application for the 1000 posts of constables. Here detail about exam of HP police constable, syllabus of constable exam and also previous year question papers of Himachal Pradesh police constable exams are available. Last date to apply for the post of constable is 15th June 2017. Detail about exam, Qualification , selection process, age limit and fee detail etc are given below. Candidates those who want to apply for the post of Constable in Himachal police should have age between 18 to 23 years and relaxation in age will be according government rules. To apply for the post of Constable candidates must possess Higher secondary education passed (12th ) passed or its equivalent from a recognized institution and board. Fee for different Categories is given below. Application procedure to apply for the HP police constable exam 2017 is given below. - Eligible candidates can apply online through official website of Himachal Pradesh police. - Official website of HP police - www.hppolice.nic.in. - Select required post and fill all details according to instructions. - Fill submit button after filling all details. - Don't forget to take print out of your application form hard copy. Last date to apply for the post of Constable is 15th June 2017. Soon notification will be updated on official website and Apply link will be available. Himachal Pradesh public service commission, has invited application form for the recruitment of Naib Tehsildar Class II posts on regular basis in January 2017. Interested candidates can apply online for Naib Tehsildar post before 18th January. Fee, age,Qualification,Detail about Naib Tehsildar post. To apply for HPPSC , Naib Tehsildar post age should be between 21 to 45 years. But condition in this relaxation is that this relaxation is applicable in upper age limit only and person should be bonafide Himachali. - For H.P. Govt. employees and Ex-Servicemen of Himachal, age relaxation is as per Government’s instructions. Candidates those who want to apply for the post of HPPSC, Naib Tehsildar post, candidate should be graduate from a recognized university. Knowledge of customs, manners and dialects of HP and suitability for appointment in the peculiar conditions prevailing in the Pradesh. There are four parts of exam and viva-voce as given below with number of marks. 5. Viva - voce - 40 marks. Minimum marks to clear exam is 33 %. Every section is necessary to qualify, any one fails in above part will be considered as disqualified. Passed candidates will be asked for viva-voce according to merits. - Go to official website of HPPSC. - fill details carefully , with original E-mail id and phone number. - Pay fee either through ‘e-Challan’ or ‘e-Payment’ option. - Candidates can deposit the requisite examination fees at any branch of Punjab National Bank through an (e-Challan) generated through the website of the Commission. - Candidates need to go on official website to go on home page of the 'ON LINE APPLICATION FILLING SYSTEM' by entering User ID and Password. - Password and User ID is generated during end of submission of online recruitment applications (ORA). - Go on 'FEE DETAILS' and enter the details of “Branch Code / Name, Transaction Number and date of deposit” and then click on “Update Fee Details”. - Candidates can apply online with credit card and debit card etc. Read instructions Carefully before applying for the post.